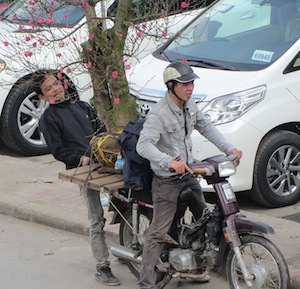 I live in Au Co, near the orchards and flower market, and the main road right now is a manic mess of motorbikes, flower sellers on bikes, and walking and moving trees. 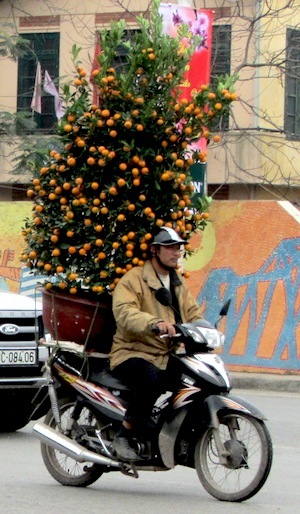 It’s just days before Tet and everyone in Hanoi is buying a kumquat tree for good luck in the coming Lunar New Year. Kumquats look like really cute baby mandarin orange trees, and according to one of my Vietnamese colleagues, it’s very important the tree has “good posture”. Not standing up straight, but a pretty shape.These trees are typically carried to their new homes by stern-looking motorbike drivers, miraculously balancing them on the backs of their bikes. The branches of pink-blossomed peach trees are also popular and I’ve even seen heavily-bonsai’d dragon fruit trees on the move. More and more lilies and chrysanthemums are emerging for sale in little side lots, along the sides of roads and as a sideline. Even the juice bar near the school I work at has started selling small trees and flowers out front. I’m heading to New Zealand over Tet to visit my brother and his family, so will miss the actual day. But by all accounts, Hanoi becomes a bit of a ghost town, with shops closed, banks closed and everyone at home with their families. To everyone in Vietnam: Chúc Mùng Nam Mói’ – Happy New Year. Great to hear from you and hoping your travel writing is going well. I’ve just started my Tet holiday and am in Sydney, on my way to visit my brother and his family in Auckland. Funny not seeing motorbikes on the streets! I’ll be back in Canada in May, and hope you can come over to Bowen then.